Obviously, the risk of trichinosis is something to be held in contempt by anyone who partakes of this raw meaty dish. New must have on farming old content? Guaranteed chance for speed increase which is 70% for 6 seconds, works on anything you can kill and any level. Ridiculous for farming old raids and dungeons and of course great for doing world quests. Buffs you with Sprint which gives you 70% speed increase for 6 seconds after killing an enemy. It stacks with passive speed increases such as Spirit Wolf, Cat Form, and talents like Feline Swiftness, but not with temporary speed buffs like Sprint, Dash, or Nitro Boosts. Does not have an internal cooldown, and works on low level content. Just tested this on a Pandaren and I can confirm that the Epicurean racial (Double stats from Well Fed) does NOT work with food like this. Pandas are better off sticking to the boring food, I guess. Bit disappointing. This food buff is a must-have for anyone who is soloing legacy content. The speed boost you get after a kill is 70%, just like the Draenic Swiftness Potion, except it lasts for 5 seconds. However, there's no internal cooldown on the buff, so you can chain kills of trash mobs to maintain a sprint throughout a run. Additionally, there's no requirement for the enemy you kill to grant experience or honor, or even be a real enemy. I chained through a bunch of critters in Icecrown Citadel to keep the speed buff up. This is absolute an amazing food if you don't actually need to worry about any stats. You HAVE to get the killing blow to gain the speed buff. If you're doing world quests with a bunch of other people there, you will rarely get the speed buff. I was wondering if this would stack with rogues fleet footed and hit and run? Could be quite nice(er) for questing if so. Does the effect work on the Il'gynoth fight in the Emerald Nightmare raid? The sprint effect enables Heroic Dark Animus to Finally be soloed easily without any shenigans and/or extreme frontloaded burst. Thank you bears, your sacrifice will be remembered. The buff does not work in BGs/you can't get the buff from eating it in BGs. 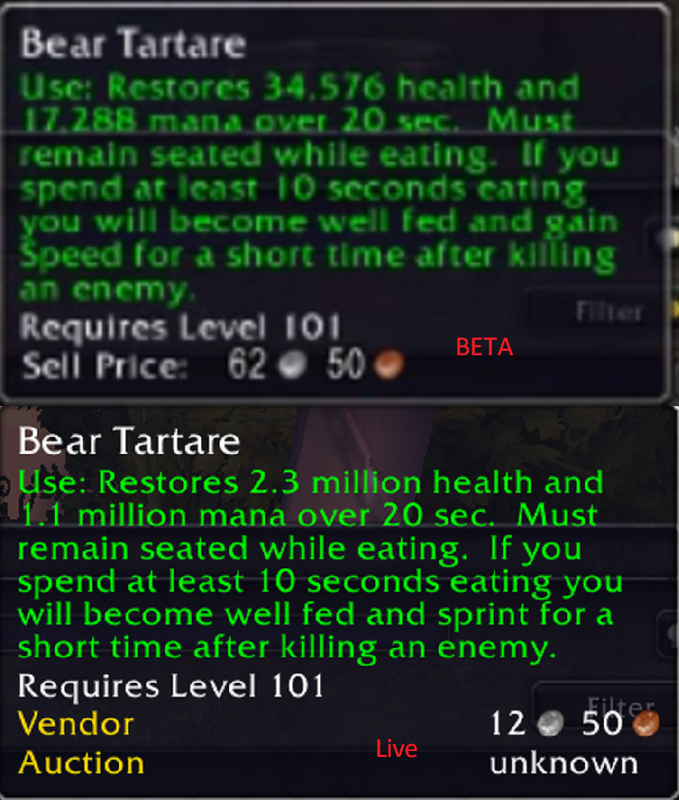 If you are doing a lot of world quests across many characters then Bear Tartare is a great choice to speed it up. It truly is a shame that the company is so greedy since its evolution into a pay-to-win game that items like Bear Tartare, Cross Realm Assist are removed from the game. At BEAR (Ha,Ha) minimum a compromise should be made allowing them to be used for older content. *Applies Nerf Hammer to the face. Currently in Patch 8.0.1 Bear Tartare gives flat 250 Speed rating. That translates into ~9% movement speed increase. Note that the % movement speed increase you get from this proc is gonna be based on how much speed you already have. On my feral druid, I go from 170% to 174% with this food. If I use another gear set, I go from 156% to 162%. Use: Restores 35757 health and 17878 mana over 20 sec. Must remain seated while eating. If you spend at least 10 seconds eating you will become well fed and gain Speed for a short time after killing an enemy.